Long ago a Buddhist monk left his tofu overnight in the snow and discovered a method of tofu preservation, freeze-drying. Frozen and thawed over twenty winter days outside, pressed, sliced, and air-dried. U.S.A. Non-GMO soybeans and magnesium sea salt. Great in soups, stews, chili, vegetable and bean dishes, and with arame or hiziki sea vegetables. Quick cooking and a good source of high quality vegetable protein. Ideal for home use or camping. Low fat, saturated fat and cholesterol free, and sodium free. 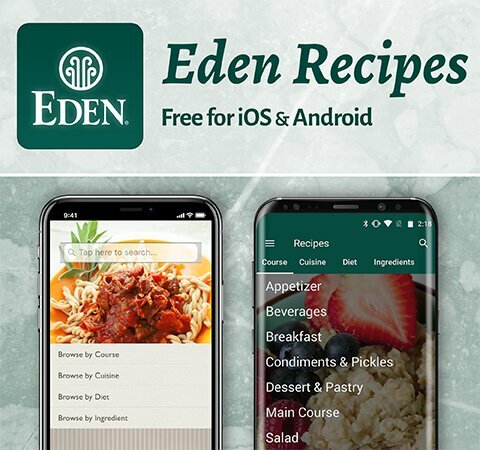 Eden Dried Tofu is from freshly made firm tofu using only whole, Non-GMO soybeans, and 'nigari', a high magnesium mineral salt used to coagulate soymilk into tofu. The tofu is made in the traditional manner used for centuries. After the tofu is made it is cut into blocks and frozen for 20 days. After defrosting the tofu is pressed to remove water, sliced and naturally air dried before packaging. Frozen tofu was discovered over 1,000 years ago at a Buddhist temple. A monk had accidentally left freshly made tofu outside in the snow overnight where it froze solid. After thawing in warm water the texture had completely transformed. It had became very finely grained, highly absorbent when cooked with other foods, and had a tender, chewy texture. Unfortunately the tofu had to remain frozen or it would spoil quickly, and it was heavy and difficult to transport. About 750 years ago Buddhist monks at the Mt. Koya Temple in Japan invented an ingenious natural method for drying frozen tofu. It was one of the world's first freeze dried foods. The tofu was placed on shelves in an unheated room for two weeks with temperatures below freezing. After thawing in warm water the blocks of tofu where pressed to remove liquid. The blocks were then sliced and placed in a heated room where it was left to dry into crisp cracker like slices. The slices were now lightweight, convenient and easy to store for several months. This product became known as "koya dofu". In the fifteenth century a military commander saw the value that dried tofu had for rations. He simply left freshly sliced tofu outside to freeze and dry in the sun for several weeks. This new dried tofu now became known as 'kori dofu' and was almost imperishable. Over the years many methods where used to dry tofu, all of which were natural until recently. Most modern commercial tofu is made with calcium chloride to make it softer instead of the traditional natural mineral salt, nigari. Also, the tofu is treated with ammonia gas to set the color and make the tofu fluffier by causing it to expand more than traditional freeze dried tofu. Eden Dried Tofu is processed in the traditional way, naturally frozen and air dried. It is made without ammonia gas, and contains no preservatives, color agents or additives. Eden Dried Tofu is good source of protein and phosphorus. It contains no cholesterol, is low in fat with no saturated fat, low calorie, contains no sodium. 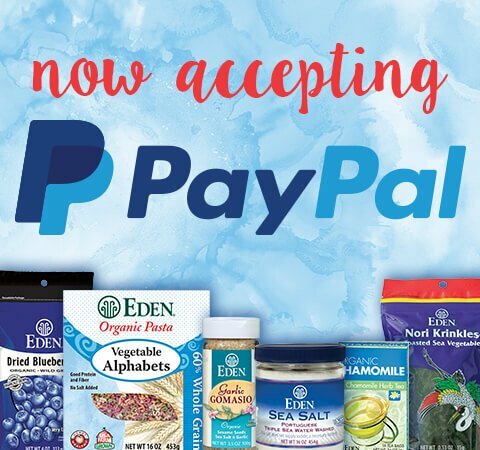 According to the FDA, "Diets low in sodium may reduce the risk of hypertension or high blood pressure, a disease associated with many factors." 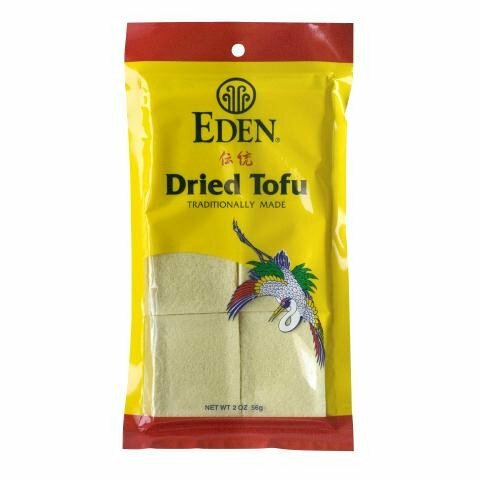 Eden Dried Tofu has a very mild flavor and is highly absorbent. When cooked with other foods the tofu soaks up their flavors. 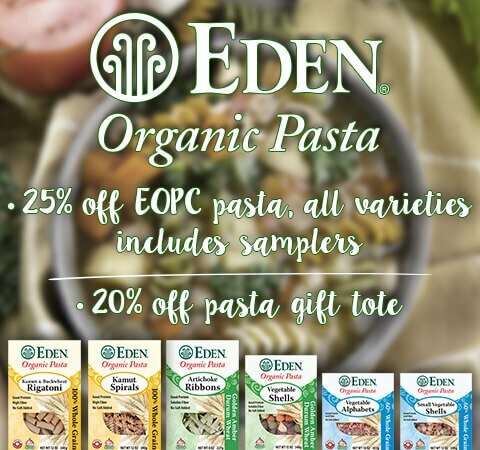 Use Eden Dried Tofu in soups, stews, in vegetables or sea vegetable dishes and in stir fries. Dried tofu needs approximately 20 minutes cooking time and is best for medium to longer cooked dishes. Shred it after soaking and use in place of meat or chemically produced textured vegetable protein in chili, tacos, refried beans, burritos, stuffing, casseroles and grain burgers. Great for camping trips.